I am alive and well in Montgomery, Alabama. On November 9, 2012, Lawless America...The Movie will film victims of government and judicial corruption in the capital of Alabama. We begin filming at 10:00 am at the Marriott Residence Inn, 1200 Hilmar Court, Montgomery, Alabama 36017 -- 334-270-3300 . I am in Room 1212. When you come down Hilmar to the front of the hotel, turn right and come to the side of the building. 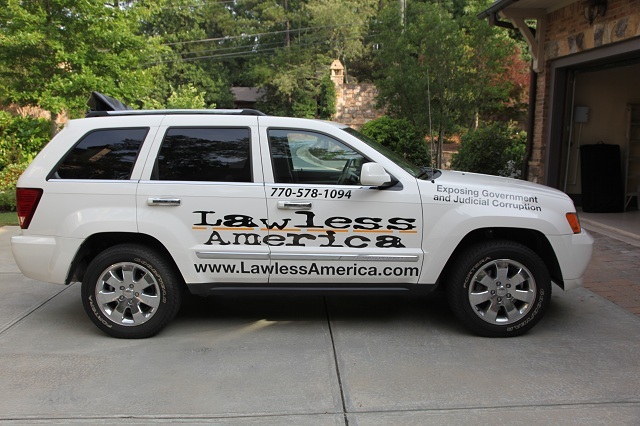 You'll see the Llawless America Jeep poutside Building 11. Building 12 is just behind it next to the swimming pool. If you would like to be filmed, come tell your story for the movie. Just show up, and we will try to work you into the schedule. Please bring a photo ID as we are taking security precautions since we are quite sure the government would like to stop this movie.